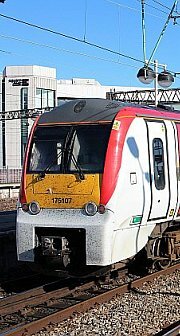 This site is devoted to all things relating to the railways of North Wales: the main lines from Manchester and Crewe to Bangor and Holyhead, and the branch lines to Blaenau Ffestiniog and Llandudno, plus the connecting routes from Manchester and Shrewsbury, and the line around the Cambrian Coast. Local heritage railways are also within our remit. The site is purely a hobby, and has no connection to any rail company; we cannot be responsible for any travel problems you might encounter. Compiled by Charlie Hulme. Contributions and comments are welcome: see the Contributions page.